Africasino is owned and operated by Equinox Dynamic N.V and is licensed and regulated by the Government of Curacao. Games are provided by reputable third parties that are independently tested and audited for fairness and randomness. The casino uses SSL encryption technology to ensure that all your personal and financial information is kept safe and secure. Africasino has been designed with an African theme and is tailored towards South African players. The casino accepts South African Rand (ZAR). Players are able to play top rated casino games through instant play and will not need to make any downloads. Play Africasino Mobile Casino From Your Mobile or Smartphone in Rand. Africasino uses multiple software providers so that they are able to provide players with the best games on the market. There is an abundance of slot games from NetEnt and you will find titles like Guns n Roses, Gonzo’s Quest and Starburst as well as slot games from other software providers. The online casino offers players video poker and titles include Deuces Wild, Alien Poker, Joker Poker and Jacks or Better. There is a great selection of table and card games and include variations of blackjack, roulette and table poker as well as offering baccarat, Red Dog, Craps, Sic Bo and Keno. You will also find scratch card games for instant wins. The live casino is powered by Extreme Live Gaming by Novomatic and offers blackjack, roulette and baccarat as well as variations. You will also find progressive jackpot games from Betsoft that are pooled across the casinos network. Titles include Greedy Goblins, Treasure Room, Mr. Vegas and Glam Life. Players at Africasino are rewarded with generous bonuses and promotions. 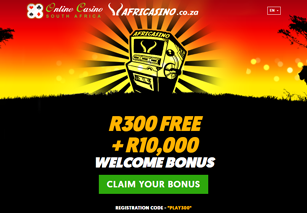 Africasino is offering new players at the casino a R300 free no deposit bonus. You will need to create an account at the casino, verify your email and use the code PLAY300 to claim the bonus. Once you are ready to make a deposit, you will be able to claim the generous welcome bonus. The first deposit will give you a 300% match bonus for up to R6,000 plus 20 zero wager free spins. The second deposit will give you a 50% match bonus for up to R1,000 plus 50 zero wager free spins. The third deposit will give you a 100% match bonus for up to R3,000 plus 30 zero wager free spins. If you are a high roller you can use the Enhanced High Roller Bonus. This bonus is for those that want to deposit R3000 or more. As a high roller, you can get a cashback plan; lower wagering requirements, a higher bonus percentage or other such benefits depending on your needs. The VIP scheme at Africasino has 4 tiers and loyal players can become VIP members. You will start at Bronze level and when you move up a level you will be rewarded with a one-off gift. Your loyalty level will also entitle you to weekly promotions and benefits. Every wager made at the casino earns Cash Points and the amount is dependent on your VIP level. These Cash Points can be redeemed for cash. Africasino offers players a comprehensive FAQ section, where they will find the answers to the most common questions asked by players. If you need further assistance, then you are able to contact the customer support team that is available 24/7. Customer support can be contacted via email or live chat. Players are also able to request an instant callback from the casino. Africasino offers a few banking methods to South African players. Deposits can be made with Visa, MasterCard, Neteller, Skrill, EasyEFT and ecoPayz. Withdrawals can be made with Visa, Wire Transfer, Skrill and Neteller.